In 1976, Omahaki feral sheep were reported to be found around the confluence of the Ngaruroro and the Taruarau Rivers, in the Eastern Ruahine State Forest, and on the Big Hill and Omahaki stations. There appeared to be several hundred sheep spread over an area of some 7000 hectares of scrubland, screes and bluffs. In his report on feral sheep in New Zealand (see » About Feral Sheep for reference), scientist Tony Whitaker noted that the origin of this flock was uncertain but it was known to have existed there for over fifty years. It was probably the remnant of a much larger feral flock that had its beginning in the Merino sheep that had been grazed on the open tops of the Ruahines in the previous century. (In the early 1960s feral sheep were know to exist in six different Ruahine catchments but were now reduced to this one area in the northeast.) There were indications that the proportion of black sheep in the Omahaki flock was increasing over the years. 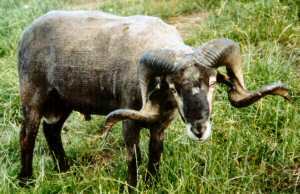 Some Omahaki sheep have been brought out of the area, but often they are run with the very similar » Mohaka sheep – which has led to a questioning of the purity of some individual animals.